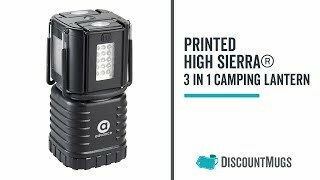 Aside from being a smart and unique gift idea, these High Sierra 66 LED 3 in 1 Camping Lanterns will also do a great job in promoting your business! If you're looking to get your business name out there and reach more potential clients, then these lanterns are the right products to use! Our lanterns features bright white 66 led lights with dual optional removable 3 led flashlights and includes two metal rubber coated carry handles. Here at DiscountMugs.com, giving your lanterns a personal look is just a piece of cake! Just have your own artwork, text, or logo printed on these lanterns and you're all set! For all of your personalization concerns, we have an online design lab and art department ready to assist you! Order from us today and make the most out of 110% lowest prices guarantee!